Child's 3 piece stainless steel cutlery set engraved with cross motif. Child's 3 piece stainless steel cutlery set engraved with Crown and Prince motif. Child's 3 piece stainless steel cutlery set engraved with Teddy motif. 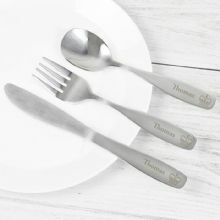 Child's 3 piece stainless steel cutlery set engraved with Train motif. 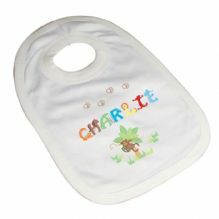 This fun and cute bib spells out the child's name in an animal character alphabet. 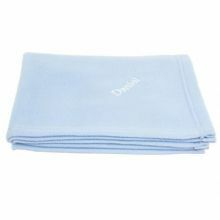 These lovely soft fleece blankets can be embroidered in white thread with any baby's name. Personalise this Blue Baby Elephant Gift Box. 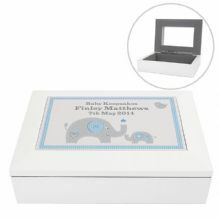 Personalise this Blue Baby Elephant White Keepsake Box. 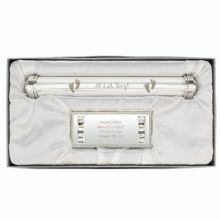 Personalise this gorgeous silver plated 'Its A Boy' certificate holder. Patchwork Train Baby Bib. Personalise with child's name in the steam. 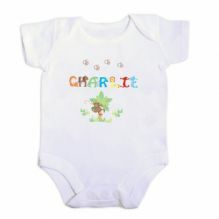 This fun cute baby vest features a colourful patchwork train design. 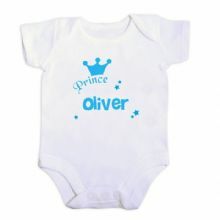 Personalise this Prince Baby Vest. Personalise this Twinkle Boys Blue Gift Box & Baby Vest. 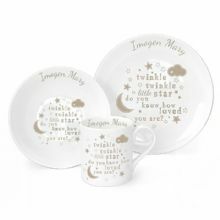 Personalise this Twinkle Twinkle Little Star Breakfast Set. 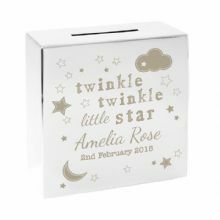 Personalise this Twinkle Twinkle Little Star silver finish square money box.